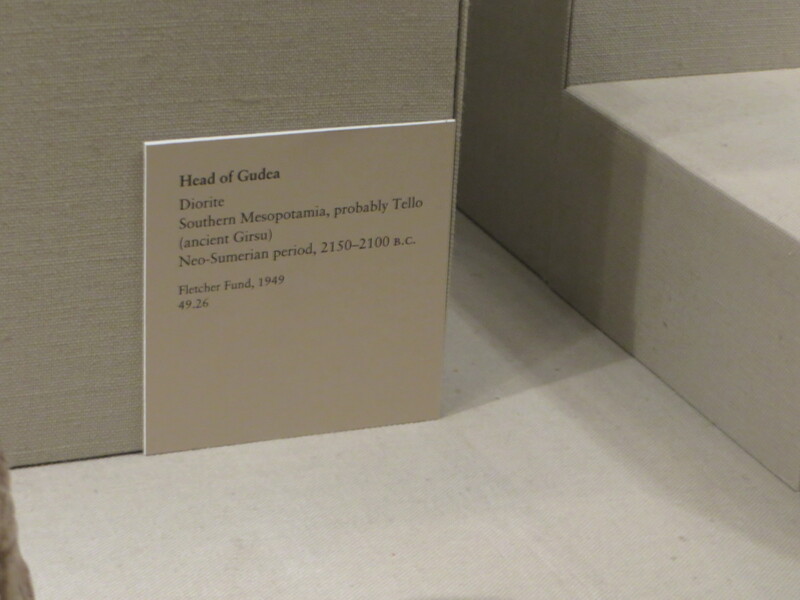 The first thing I noticed was the ancient ruler Gudea’s large headed and calm disposition, I misread the wall label. It said he was a “governor” so I assumed he was a mere courtier, ready to receive supplicants and supplications. He wears his generosity and piety on his sleeve, as it were. In a modest seated position, but not too modest, the inscriptions etched onto his robe testify to powerful beneficence. It turns out that what we’re looking at is piety and power. Given their antiquity, I’m still surprised slightly by the strong verisimilitude that characterizes these sculptural representations of him. He looks modern, like a cross between the Buddha and Mussolini. 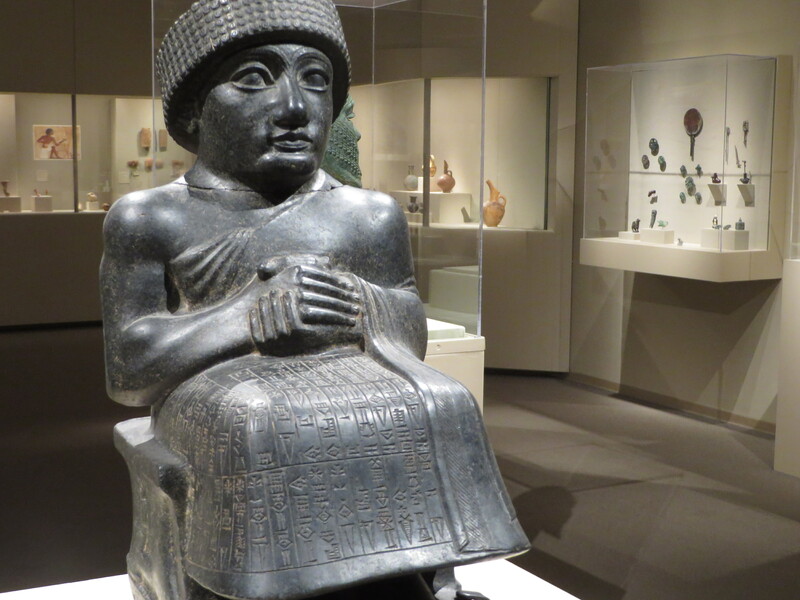 You can find statues of Gudea here at the Met and at the Louvre. 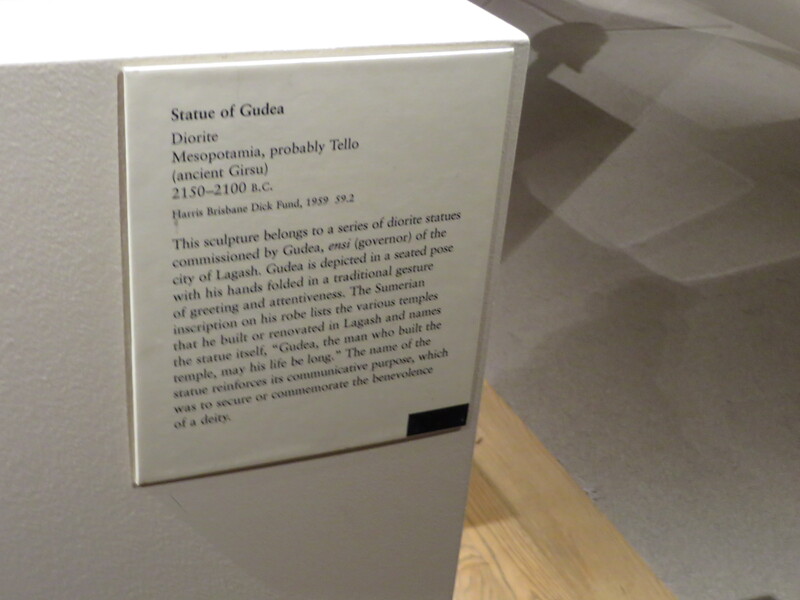 Everything I know about Gudea I got from the Met and Wikipedia, from which I quote below. 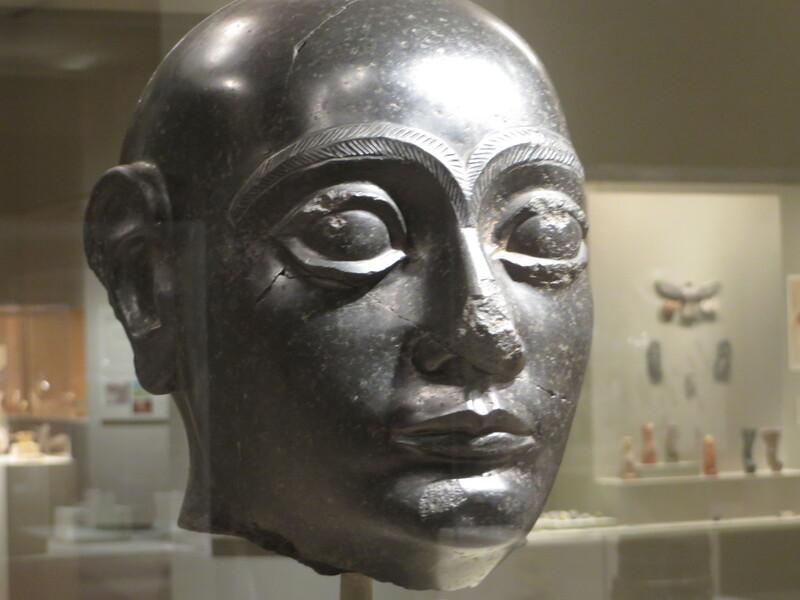 No mere court figure, he was a ruler (ensi) of the state of Lagash in Southern Mesopotamia who ruled ca. 2144 – 2124 BC. Lagash was an important Sumerian city in the late 3rd millennium BC located just a bit north from the point in southern Iraq where the Tigris and Euphrates Rivers meet. These and other like statues were installed in the temples he built. As for the material constitution of the statue, it is made of diorite, a “grey to dark-grey intermediate intrusive igneous rock composed principally of plagioclase feldspar (typically andesine), biotite, hornblende, and/or pyroxene.” This is the hard stuff of sovereign power sponsoring religion and taking its place in the temple. As physical objects, these things were were made to last, and have held up well. That’s why they look so good. This entry was posted in uncategorized and tagged ancient Near East, art, Museums & Galleries, politcs, religion. Bookmark the permalink.